Tint World announces the launch of new Tint World mobile site. We want our consumers to connect with our franchise locations at any time so they can get instant access to store check-ins, product purchases, and services. As part of its continuing efforts to provide a streamlined experience for consumers in need of a range of automotive styling services, Tint World has launched a mobile version of its website that will allow users to more easily access product information and services. 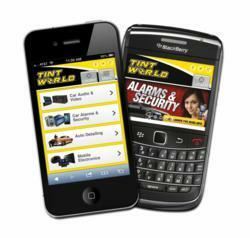 Smartphone users will be automatically directed to the mobile website when they navigate to TintWorld.com. Each page of the mobile website offers a direct link to the company’s full website for users needing additional information. The mobile site also provides a geo-location based feature supplying store information and product availability for those on the go. This feature of mobile marketing connects the national brand and local franchise locations with consumers, using personalized messages based on the actual location. Tint World’s mobile marketing drives engagement, enables personalization, and ensures each Tint World location is promoted at the right time. The mobile website also provides links to all of Tint World’s social accounts including Facebook, Twitter and Google+, allowing consumers to connect with franchisees through social media where even more content is available. Established in 1982 in Tamarac, Florida, Tint World® is now the leading franchised provider of automotive, residential, commercial, and marine window tinting and security film services in the US. Tint World® Automotive Styling Centers also offer auto security, mobile electronics, performance and styling accessories, custom wheels and tire packages, auto detailing, and reconditioning services.